Umm... Some pictures that include the interior, trunks, and the usual trouble areas? Mileage? Original paint or re-spray? You might be on the slightly low side, absent further info and if as described. Really, really, nice examples have moved for more than that. I defer to the real experts here, though. I'm not one of them. Just my opinion. (IMG:style_emoticons/default/thisthreadisworthlesswithoutpics.gif) and if your selling place an ad in the classifieds. If you are comfortable with the range you stated list it that way. I searched out your past history. You are not very forthcoming with photos and details. Much has been observed and commented on about his listings on Ebay and here. The glory that once was. Pics add value. Pics prove value. Help us help you. Go over to Bring A Trailer and see what past auctions have gone for or not gone for. Seems to be the way ,not much of a thread without pics...waste of time really (IMG:style_emoticons/default/confused24.gif) (IMG:style_emoticons/default/confused24.gif) . If you want an easy sale, list it for 65K. (IMG:style_emoticons/default/bs.gif) as we say in my bbq forum, no pics? Never happened! I’m picturing my car in my mind. What do you all think it’s worth? 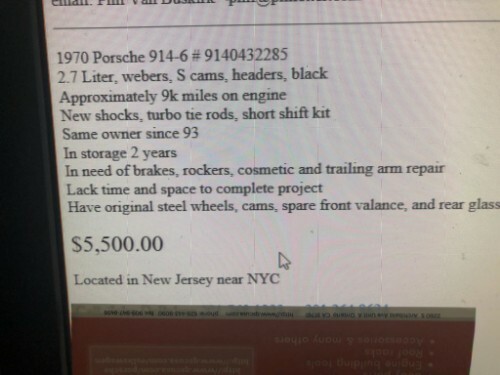 This is just a "my car is for sale but I don't want to go through the hassle of making an ad, so maybe buyers will just contact me if I put it out there that I'm selling a /6" thread. Save yourself some aggravation and do some research on "lostreasure". "Porker"? (IMG:style_emoticons/default/biggrin.gif) in the back? 50 to 120K is the range right now. Condition is the key here. I'll bet the OP is lowballing a seller and is using this thread to support his offer. Good point. I hadn't thought of that one. Must be something in the air around New Jersey..